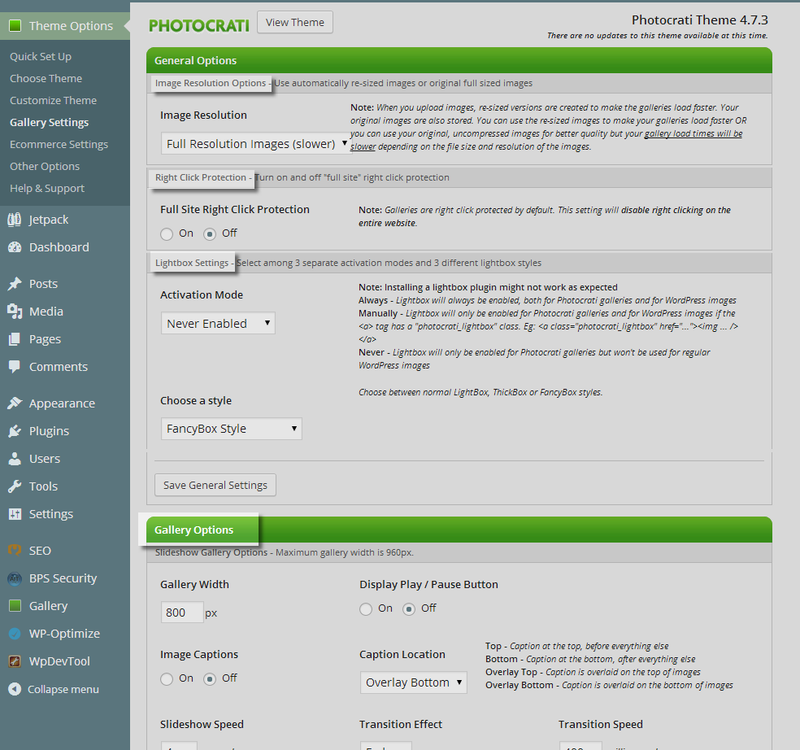 The documentation below refers to an older legacy version of the Photocrati Theme. We recommend that you upgrade to Photocrati Pro and enjoy our new gallery system NextGEN Gallery with NextGEN Pro. IMAGE RESOLUTION - When you upload images, re-sized versions are created to make the galleries load faster. Your original images are also stored. You can use the re-sized images to make your galleries load faster OR you can use your original, uncompressed images for better quality but your gallery load times will be slower depending on the file size and resolution of the images. RIGHT CLICK PROTECTION - Galleries are right click protected by default. This setting will disable right clicking on the entire website. Choose between normal LightBox, ThickBox or FancyBox styles. SLIDESHOW - Control the width setting, display controls, turn on/off captions, slideshow speed, transition speed & effect and border style settings. BLOG STYLE - Control image width, image spacing, & border style settings. HORIZONTAL FILMSTRIP - Control the thumbnail size, gallery width setting, display controls, turn on/off captions, slideshow speed, transition speed & effect and border style settings. THUMBNAIL - Control the thumbnail size, turn on/off captions, thumbnail cropping (With thumbnail cropping ON all thumbnails will be sized at the exact height and width specified and will be automatically cropped. Turning cropping OFF will display thumbnails at their original aspect ratio BUT will result in uneven gallery layouts if mixed sized images are used. ), border style settings. *Note - a common question is if you can custom crop the thumbnails, this option is not available yet. We do plan on adding this option in a future upgrade for the Photocrati Theme. ALBUM - LIST VIEW - Set the background color, title/font color, title size, border color & size. ALBUM - GRID VIEW - Set the galleries per row, background color, title/font color, title size, border color & size. * Thumbnail size will adjust automatically based on the number displayed per row. * The cover image for your galleries is selected from the first image in the gallery.